Here in North Finchley there seems to be an abundant amount of people suffering from foot disorders that cause them a great deal of pain and negative effects on their daily living and activities. These disorders are vast and can range from complex biomechanical musculoskeletal disorders to routine pathologies caused by pressure and friction on or around the foot. Podiatrists train for 3 years in order to be able to assess, prevent, diagnose and treat abnormal conditions of the foot and lower limb. We are firm believers in continuous training to maintain best practice and are dedicated to helping reduce our patient’s pain and increasing their quality of life through our services. Poor circulation and sensation in the feet, most commonly Diabetics. Treatment of ingrowing nails conservatively or nail surgery. Common biomechanical disorders: bunions, lesser toe deformities, heel pain, plantar fasciitis, arch pain and flat feet are just some examples. Prescription of simple and casted insoles. Removal of corns and callus hard skin. 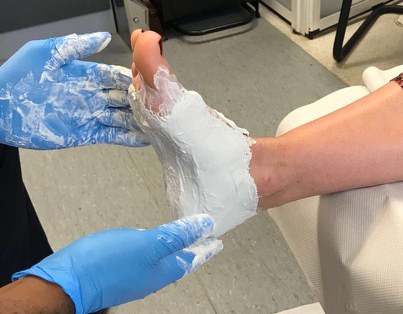 As part of our treatments we may use padding material, silicone devices and simple insoles to off-load and treat painful areas of our patients’ feet. We will also often provide general advice on self-care and maintenance. Through a comprehensive assessment, the Podiatrist can diagnose and treat a wide range of musculoskeletal conditions and/or biomechanical issues that can produce pain and poor foot function. This will include assessment of the lower limb, and not just the foot and ankle. We can assess and diagnose hip, knee and posture problems which may cause referred pain in the foot and lower limb. A visual gait assessment may be required and a prescription for a foot orthotic may be essential to alleviate pain symptoms and improve foot function. The patient may also need to be referred to an appropriate health professional or clinician should there be any conditions which require diagnostic techniques such as imaging/blood test or alternative management. A package treatment is recommended as it is proven to be the most effective at removing verrucae. An ingrowing toenail can be very deep and cause a haemorrhage/infection at the border of the nail and toe which can be very painful to remove. A local anaesthetic can be used to temporarily numb the area and remove the offending nail spike. This is a permanent procedure (98% success rate of no regrowth) where either part or the whole nail is removed. This is done under local anaesthetic and a chemical is applied to prevent the nail from growing back. If you are experiencing any kind of foot pain or discomfort and you can get to our North Finchely clinic then it may be beneficial for you to book an assessment with one our of podiatrists. We are currently running FREE foot assessments, so if you’re not sure whether podiatry can help you then call or email us to book one of these. If you would like to know more or book an appointment you can call us on 0203 356 7060 or email us at info@precisionwellbeing.co.uk.